Although close encounters with alien space craft are reported as far back as the reign of Pharaoh Thutmosis III in Egypt, it wasn’t until the 20th century that UFO sightings and extraterrestrial encounters were truly documented, due to advances in technology and record-keeping as well as the vast increase in incidents, particularly with military forces. Revealing his extensive research and the verifiable evidence he’s discovered, Frank Joseph presents a comprehensive military history of armed confrontations between humans and extraterrestrials in the 20th and 21st centuries. He explains how, with the development of atomic bombs and ballistic missiles, the frequency of extraterrestrial intervention in human affairs increased dramatically. He documents incidents both famous and little known, including the explosive demolition of U.S. munitions factories in 1916 by unearthly aerial vehicles, the Red Baron’s dogfight with a UFO during World War I, “foo fighter” sightings and battles with Allied and Axis combatants during World War II, and eye-witness reports from encounters during the Korean War, the Vietnam War, the Gulf War in Iraq, and the ongoing hostilities in the Middle East. He examines the evidence for the shoot-down of “flying saucers” at Roswell and Aztec, New Mexico, alien sabotage of nuclear weapons systems, and in-flight abductions of USAF and Soviet officers and airplanes. He explores the photo evidence for the Battle of Los Angeles, which occurred three months after Pearl Harbor, and the details of Operation Highjump, the U.S. Navy’s defeat in Antarctica by ET forces 17 months after the atomic bomb was dropped on Nagasaki, while also uncovering evidence of secret Antarctic German bases. The author also examines recent, 21st-century examples of alien interdiction in Earthly affairs, such as the meltdown of the Fukushima Daiichi nuclear plant in Japan and the fiery abort of Elon Musk’s Falcon 9 missile launch, both events accompanied by UFOs. 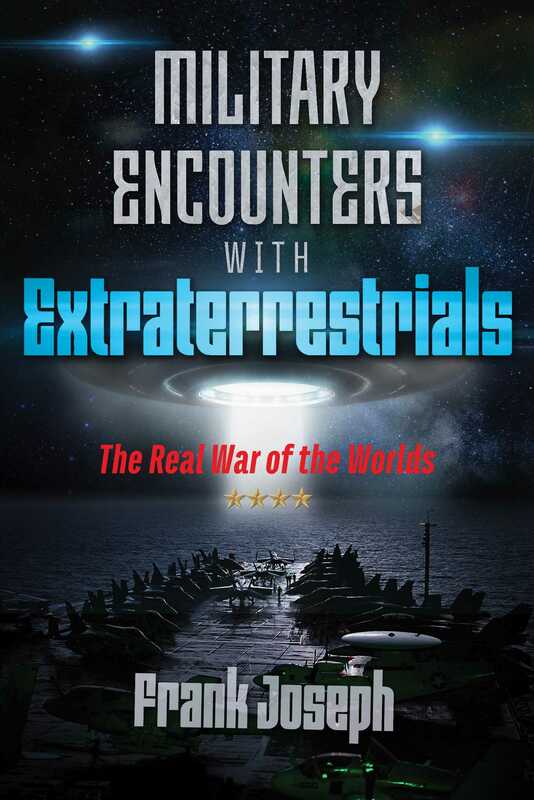 Offering complete disclosure of the multitude of ET events over the past century, Frank Joseph gives us the first true reference book in the field of alien military encounters. Talking about his Operation Highjump expedition to Antarctica, Admiral Richard E. Byrd Jr. said the most important result of his discoveries was the effect they could have on the security of the United States. The fantastic speed at which the world is shrinking, he recalled, was one of the most important lessons he learned. On his return to Washington, D.C., after Byrd’s interrogation by Security Services officers, he never uttered another word about Operation Highjump, which was simultaneously classified, thereby legally preventing any of its veterans from ever discussing the mission. Shortly thereafter, the U.S. Navy published a brief and rather evasive summary of the Antarctic expedition’s “achievements,” which nonetheless stated that some losses had been incurred. Although these were glossed over and minimized, the anonymous report nonetheless admitted that fully half of Byrd’s seaplane and helicopter forces had been lost, and that he himself was nearly brought down in the aircraft he was flying, avoiding a crash only because he jettisoned everything on board in order to stay aloft, save the barest essentials and the reconnaissance films he had just taken. The summary further admits that Task Force 68 did indeed suffer some human casualties, but all were supposedly due to accidental causes. On December 30, 1946, three men flying George 1, their Martin flying boat, died when it crashed, allegedly during a blizzard. Six surviving crew members were rescued thirteen days later. Another man supposedly died in a construction accident, totaling the number of fatalities. The official summary concludes by explaining that the mission was terminated because of the early approach of winter and worsening weather conditions, which were supposedly just what the Americans had specifically come for and required to test themselves and their equipment. A brief film about Operation Highjump, ironically entitled, “The Secret Land,” was released in 1948. Although it was more of a chest-pounding propaganda piece for the U.S. Navy than a real documentary, it gives viewers some feeling, however incomplete, for the expedition. The short went otherwise unnoticed by the general public, and soon fell into virtual obscurity. After the collapse of the Soviet Union in 1991, however, millions of the defunct regime’s secret papers were suddenly declassified, among them, surprisingly, a 1947 description of Task Force 68’s mission to Antarctica. That Joseph Stalin should have known far more about the expedition than the American people is not surprising. America’s close alliance with Stalin during World War II allowed his spies to infiltrate all levels of the U.S. government, including its armed forces. Because of the high positions spies often attained, they had access to classified accounts of undertakings such as Operation Highjump. Details of the expedition, hidden from the U.S. public and the rest of the outside world, were transmitted by a Soviet operative to the Kremlin, where they languished until their rediscovery before the turn of the twenty-first century. Shortly thereafter, a Moscow Television documentary finally disclosed the Stalin-era report about Task Force 68’s covert experiences in Antarctica. Nearly three hours later, the lights (five of them) reappeared in the same area of the Weddell Sea, and began to rapidly close on the destroyer. Commander H.M.S. Gimber ordered the ship’s 40-millimeter Bofors antiaircraft guns and 20-millimeter Oerlikon cannons to commence firing on the objects, which flew over the Brownson at high speed and low altitude (about two hundred feet), without achieving any hits. According to the Soviet espionage report, this encounter opened a series of brief but fierce skirmishes that lasted over the next several weeks, resulting in “dozens” of officers and men killed or wounded. The most casualties were suffered by Admiral Byrd’s Central Group, which, as even the sanitized postexpedition U.S. Navy version of the report admitted, had to be evacuated by the Burton Island icebreaker from the Bay of Whales on February 22, 1947. A variety of silvery, strangely configured craft then executed noiseless, menacing passes at the naval units, which fired their ordinance at the triangular and boomerang-like vehicles. No casualties were sustained on either side during these first, fleeting near misses, and the unidentifiable vessels did not return fire before quickly vanishing into the morning sky. A few hours later, in the early afternoon, an enormous, cigar-shaped object floated silently, like some gargantuan dirigible, low above the surface of the sea. When the unmarked intruder unintentionally drifted within range of the USS Sennet, Commander Joseph B. Icenhower ordered the submarine’s deck guns to commence firing. A direct hit with a five-inch shell amidships caused the huge craft to veer wildly out of control, then crash nose-down into the water. It was Task Force 68’s only kill. After four days of encounters, in a kind of parting shot, the spherical lights executed a dramatic attack witnessed by Lieutenant John Sayerson, a flying-boat pilot. Sayerson reported: The thing shot vertically out of the water at tremendous velocity, as though pursued by the devil, and flew between the masts [of the ship] at such a high speed that the radio antenna oscillated back and forth in its turbulence. Frank Joseph was the editor in chief of Ancient American magazine from 1993-2007. He is the author of several books, including Before Atlantis, Advanced Civilizations of Prehistoric America, The Lost Civilization of Lemuria, and The Lost Treasure of King Juba. He lives in the Upper Mississippi Valley.